Brook trout or a Great White? The aggressive nature of a brook trout reminds me of a Great White Shark sometimes, now the size and teeth on the other hand. Just a different view of a brook trout coming to the boat on a soft hackle tied by John Ingham. Thank you John. 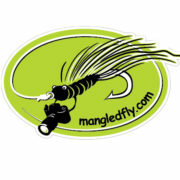 http://mangledfly.com/wp-content/uploads/2014/07/logo.png 0 0 Jon Ray http://mangledfly.com/wp-content/uploads/2014/07/logo.png Jon Ray2014-06-13 12:36:082014-06-13 12:36:08Brook trout or a Great White?